Do you ever try to do one thing differently when you get dressed? I call it brain fashion aerobics for the creative mind. This outfit was lacking a little somethin’ somethin’ and I picked a piece of blue velvet ribbon from my craft room downstairs and hopped on board the ribbon choker trend. as her head rolls onto the floor. You can skip eating cheese and just read this bedtime story for extra vivid nightmares. I couldn’t stop thinking of that story when I was wearing this outfit. I suppose that could have been the worst thing to happen trying out this ribbon choker trend. This ribbon choker trend has been roaming around for years. The most recent ribbon choker trend setter was the stylish Mr. 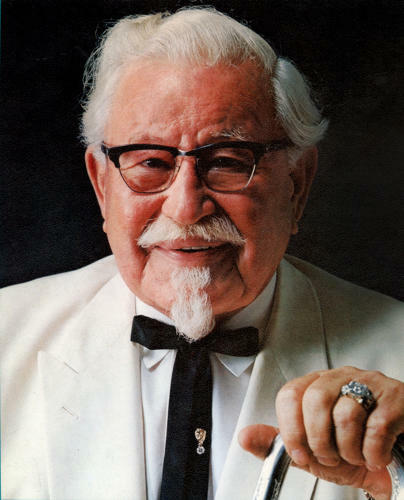 Colonel Sanders. A fashion icon in his own time and someone I often look to for style inspiration. That guy really understood how to create a personal brand and decent coleslaw. 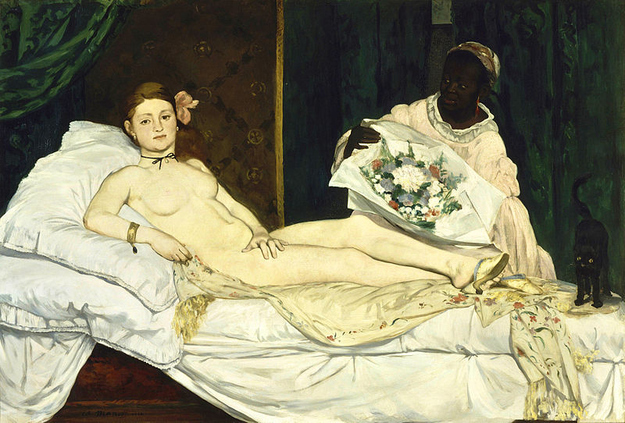 And he obviously got the ribbon idea from here Edouard Manet’s famous oil painting, Olympia from 1863. Of course at that time the ribbon choker was the sign of a working lady…but that didn’t bother Mr. Sanders. When you adopt a trend you make it your own. 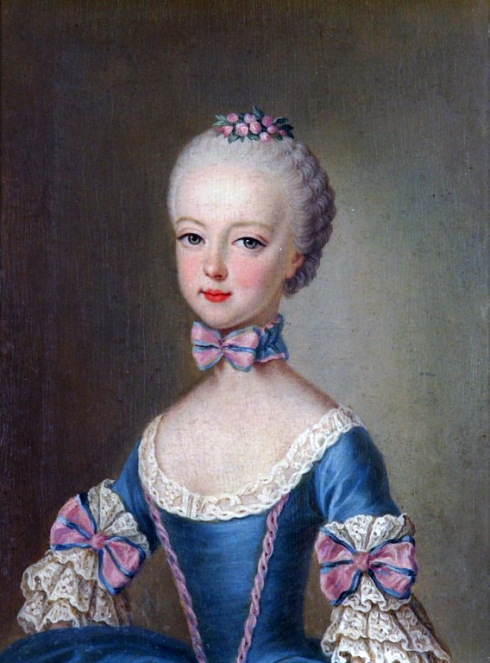 And Edouard Manet undoubtably lifted the idea from Marie Antoinette who loved to wear fancy ribbons around her neck. Yes, I can totally see the resemblance. Because seriously…who doesn’t like cake? If you’re going to try out a trend, make it your own. Trends come and go and then come back around again. Just when you think you’re onto something new, like the Bare Naked Ladies song you’ll realize, “It’s All Been Done Before“. Don’t eat cheese or read scary stories before bed. Striking blue plaid maxi! I happened to enjoy the tale of the girl and her ribbon, as well as getting in a little history lesson. 🙂 Your blue velvet ribbon was a nice finishing touch and one I may have to consider trying sometime myself. Redheads do well by this bold blue colour as you’ve shown on your blog. 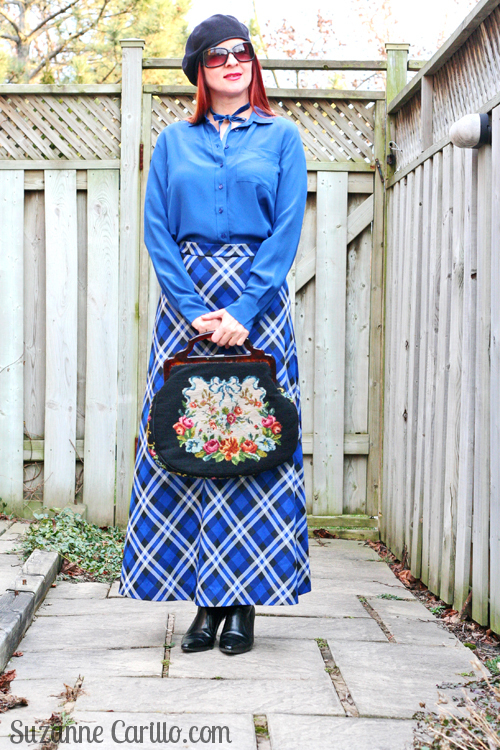 The maxi is a fun find I just recently picked up at the Toronto Vintage Clothing show. I’ve actually heard this story…but the ending happened when she was on her deathbed!! It was a little funny at the time! it must be warmer now in your town…you’re outside!! Just for your entertainment….we have a blizzard going on at the moment! I took these photos just over a week ago when it was beautiful and 22 C outside. Gorgeous. Today we are expecting freezing rain. Joy joy. Mind you, I’ll take that over a blizzard. I agree…we should start a Facebook group called cheap homemade fashion and cake. LOL Omg – that was one of my favorite horror stories growing up. I called it, “The Lady with the Green Ribbon,” and I would regale all my cousins and neighbor kids with it for the sheer pleasure of terrorizing them. lol I haven’t thought about it in years! It is the perfect finishing touch to your look, and I love all the shades of blue in this outfit. While I love the look of a ribbon tied at the neck, I hate tight things around my neck. I suffered through those hideous plastic weave chokers in middle school to look “cool”, but never again! Ha! When I was a teenager I used to work in a haberdashery and buy loads of colourful ribbon to make chokers out of. I used to tie the 2 ends to the ribbon so they slid around and I could tighten them! I’d forgotten all about that, I might have to start doing it again! I’ll put it on my list of outfit ideas I’ve stolen from you along with putting vintage brooches on my jacket! I adore the name haberdashery. What a fun place to work as a teenager. Well, you are definitely in your ankle kissing period. Another one and lovely bright blue. You remind me of spring like this. And the ribbon is very becoming. Good ribbon stories. Angel told that story to my littlest sister shortly after we moved here…and got a scolding to the tune of “you just don’t tell 8 year olds horror stories”…even though it’s one of his favorite things to do. I like the ribbon choker look! I love that story. I used to read it to my kids all the time. I figured if I read them enough scary stuff I wouldn’t actually seem like such a frightening mother in comparison. No wire hangers! I love the Manet version. Pictures please, Miss Champagne. This is a hot trend right now and you are so lovely in blue. Honestly. You are ahead of And far more amusing than the fashion magazines. Anna Wintour ain’t got nothin’ on you! Ha ha! You are too funny Connie. So many of those children’s fables were truly horrible. I had nightmares about being Gretel and being shoved in an oven for years. Also probably were my love of sweets comes from, except often instead of candy the house is made out of pastries. Oh yes. Yikes, what a story. Blue looks amazing on you, and I love the choker. This is why I feel like i can never get rid of anything. It is also the reason my closet is bursting. Well…okay part of the reason. I love this trend, it’s so cute and you styled around it wonderfully! The ribbon looks great on you. It reminds me of the two lady-bows Gracey gave me which are similar in size. Oh, and I have my Col. Sanders tie from last Halloween. That was fun to wear. By the way, I just saw your comment on Patti’s blog — is she coming to visit you in Toronto? Yes! Second part of June or July. I don’t know yet. That’s a hideous story, thank goodness I can look at you in your fabulous outfit and rid myself of that horrific vision. Blimey, I’ve never heard that story before, but it will always evoke the image of you in this outfit when I do. The maxi skirt is great but I can understand why you fancied a little something different and the velvet choker was a lovely idea. I made one with a cameo brooch on the front and put a popper on the back when I was in my teens. Goodness knows where it went. Oh. Eeew. I did not see that coming, Suzanne!! Hahaha!! Brings new meaning to the phrase, “Curiosity killed the cat”. I remember reading that story when I was a kid. I liked creepy fairy tales back then (still do). I end up stowing away pretty lengths of ribbon from packages with the idea that SOME DAY, I’ll do something with them. Perhaps I should send them to you, as I don’t think I would wear a ribbon choker (I enjoyed the visual history lesson of the trend though). The head to toe blue looks awesome with your hair. oh yes, I agree particularly about don’t eat cheese or read horror stories before bed!, and now your ribbon choker is looking very different to me, as it was an accessory with a touch of sassiness, but now is kinda gothic! Love your blue ensemble, your skirt is awesome and you look gorgeous!, lovely beret too!! I was a big fan of the “choker” in the 80s, lace ones, victorian looking ones, so this idea is cool to me. Yeah, I know everything comes full circle. I do love the blue on you, looks great with your hair and complexion. Oh, that story about the woman’s head falling off, I haven’t heard that since I was a kid at a slumber party. My husband knows I love green. He got me a green velvet choker with a HUMONGOUS pendant attached. Seriously, it’s so heavy it pulls the choker down. It’s a silver celtic design with a green cabachon. He asks why I never wear it. 🙁 I tell him it’s not an everyday necklace, because really… unless I’m Stevie Nicks or work at a Ren fair. It’s not. I’m thinking of taking the pendant off and making that into a brooch. That way I can wear the velvet choker by itself. I have received other gifts where I’ve just.said.no. I wasn’t aware of this trend, but the ribbon looks beautiful with your gorgeous blue ensemble. And the story was new for me too! I learn something new everyday from the blogs that I read and love. Thank you so much for sharing your headwear with Hat Attack!